The next ReadComics book club is planned for Saturday, May 16th, or two weeks from this coming Saturday. 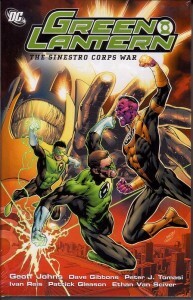 We hope to have all the regulars, and some supporting cast for this book club, when we’ll talk about Green Lantern, The Sinestro Corps War, volumes 1, 2, and if you can get your hands on it, Tales of the Sinestro Corps, which collects the final (auxiliary?) bits. This entry was posted by Martin	on Tuesday, April 28th, 2009 at 12:46 am and is filed under book club, DC. You can follow any responses to this entry through the RSS 2.0 feed. You can leave a response, or trackback from your own site.